Boston University 1963. J.D., Rutgers University 1966. Admitted to the New Jersey Bar and U.S. District Court for the District of New Jersey, 1968, U.S. Court of Appeals (3d. cir.) 1968, (2d. cir.) 1985, New York Bar and U.S. District Court for the District of Southern New York, 1984. A Member of the Firm since 1972. 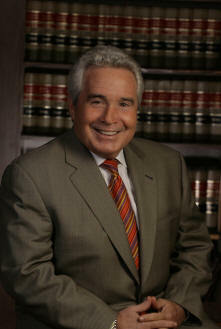 Mr. Harris is the Senior Member of Braff, Harris, Sukoneck & Maloof and leads the Litigation Department in all aspects. Mr. Harris’ trial experience spans over 45 years. He represents defendants charged with professional malpractice, manufacturing or designing defective products and construction defects. He has also has appeared before the State and Federal Courts of New Jersey and New York in defense of employers charged with violating appropriate employment practices, and engaged in labor disputes. Mr. Harris has participated in numerous trial practice programs and is a past Master of the Arthur T. Vanderbilt Chapter of the American Inns of Court. Mr. Harris has been a guest lecturer in trial practice at Rutgers University School of Law and Seton Hall University School of Law. He has also been a frequent speaker at continuing legal education seminars and at various claims handling seminars for a variety of insurance companies and major self-insured corporations. Since approximately 1990 Mr. Harris has represented defendants throughout the United States in cases involving catastrophic losses. AIG Excess, Lexington Excess and Colony regularly retain Mr. Harris to try their most serious claims. Most recent examples are the case of The Estate of Bennet v. Braun’s Trucking; The Estate of Robert Simon (featured correspondent on 60 Minutes and a renowned war correspondent) v. Skyline Credit Ride; Paris v. Tishman Construction; and Mallett v. Schmidt Bakery. In each of the above mentioned cases the demand for settlement exceeded $15,000,000. Each case resolved well within policy limits. Mr. Harris has tried approximately 75 cases to verdict in New Jersey both in State and Federal District Courts and approximately 20 cases in New York. Mr. Harris is a member of the American Bar Association (Employment Law Section and Tort and Insurance Section), the International Association of Defense Counsel (Vice Chair of the Legal Malpractice Sub-Committee), the Professional Liability Underwriters Society, the New York State Bar Association, New York Trial Lawyers Association, the New Jersey Bar Association, the Essex County Bar Association and the Defense Research Institute. Mr. Harris is a founding member of the Harmonie Group, a national association of independent law firms dedicated to providing high quality, cost effective legal services. Mr. Harris, is Martindale and Hubble Rating AV, voted New Jersey Super Lawyer (category defense of civil litigation claims); voted Top 100 Insurance Defense Lawyers in America; Licenses: State of New York, Federal District Court for the Southern District of New York, Federal District Court of the Eastern District of New York, Federal District Court for the Northern District of New York; licensed in the State of New Jersey and the Federal District Court for the State of New Jersey; admitted Pro Hac Vice in Massachusetts, Connecticut, Ohio and Hawaii.